The Acoustic Festival is very much a family that we are part of and has helped our livelihood grow. Not only do we provide our whole range of sustainable event services but have also had major influence on the basecamp festival site, Green Valley Arts, becoming 100% solar powered by installing two solar power systems there. REsource has recently joined Green Gathering on their mission to promote education for sustainability. Here we work with several other solar and wind power providers in a 'mini-grid' style of sharing power demands as well as installing our 1/2km of festoons across the site and educational displays. 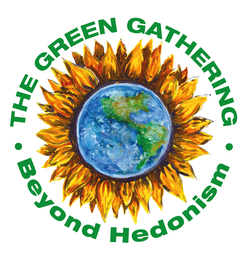 'REsource provide solar power, LED festoon lighting and educational displays at The Green Gathering. Dougal and Tess are fantastic to work with, friendly and professional, with a genuine passion for what they do. I'd recommend REsource to anyone who wants beautiful, energy efficient lighting, a stunning showcase of renewable energy, and reliable solar power at their event.' - Em Weirdigan, Green Gathering director. L Fest is an award winning lesbian music, arts and comedy festival held on Uttoxeter racecourse. REsource began with simple campsite lighting but now power access campers wheelchairs and two small stages. We also help out site crew for build and break. 'Dougal and Tess have worked with us on our festival since 2013. Their work is always done quickly and efficiently so much so that each year we are trying to add in more solar powered features. I would 100% recommend them to any festival. The lights look great and their work ethic is very professional in a extremely relaxing way' – Cindy Edwards, L Fest. Holifair is a great family festival on a working special needs farm in Cornwall. We have lived and worked on the farm in the past and love going back for the fair. Our lights go throughout the festival and as well as powering the caterers and sometimes a venue we also help out with power management. 'REsource Sustainable Event Services have worked with us since 2011. They have helped to make Holifair Festival a much greener event, providing power to our caterers and colourful LED festoon lighting throughout our festival. The result is a much more eco-friendly event, with ambient lighting, without lots of generators that the caterers would usually use. What we really like about RESource is that Dougal & Tessa are very approachable, knowlegeable and hardworking and are always willing to help out where they can. We would highly recommend them to anyone looking to make their event more sustainable, with a friendly but professional touch.' – Sharon, Holifair.